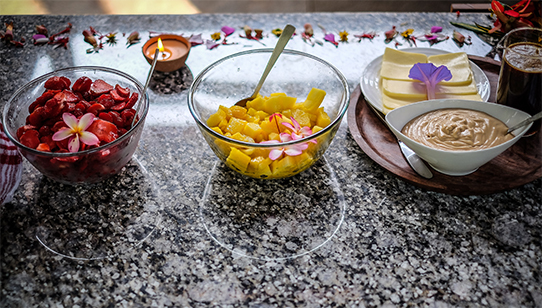 At our Amrit Kitchen we use quality organic ingredients, locally sourced foods and fresh picked herbs, veggies, and fruits from our vast garden space. We keep Ayurvedic guidelines and principles of food-combining in the preparation of all our meals for optimal health and digestion. This will ensure vitality and rejuvenation during your Yoga Retreat at Samata. For Breakfast, our intention is to serve a meal that awakens the palate to a mouthwatering experience, one that will satiate the hunger after your morning yoga session, won’t bog the body down, and offer sustained energy for the rest of the afternoon. For Lunch and Dinner, taste the flavors and spices of India with our fresh and savory Garden Thali. The arrangement alone with its colors and aromas will bring delight at first sight. Amrit Kitchen is purely Vegetarian. Special requests that stray from the choice of menu for the whole group may accrue extra costs. We recommend that the group choose one of these dietary options for the whole of the retreat. Milk: If your group is open to dairy, we support a local family cow that is grass fed, organic, and cared for with great love. In return the milk she gives is raw, cream-filled, and delicious. From this, we make spicy homemade chai with our very own garden-grown ginger. In addition, we also make butter, paneer, ghee, yogurt, lassi, sour cream, etc. Eggs: Our eggs are specially sourced from our local organic, free-range chickens which feed on organic remnants from our garden. Let us know in advance what your diet preference is, and we will design a meal plan for you to review before your arrival. If during the retreat there are any alterations, we ask that you allow time to make adjustments as everything is planned and prepared accordingly. Always a balance of sweet and savory with accents of different international tastes and flavors. ex: Apple, dates, chia, flax etc.. with all the fixings: raisins, nuts, seeds… etc. *** Often there will be homemade jams, special sauces, dressings, chutneys, syrups, pickles, etc. We make everything fresh and homemade wherever we can! See the Amrit Gallery to view images that will make your mouth water.